TypeRocket 3.0 is great at building custom data structures like post types and custom fields. Take a look at what you can build with 20 lines of code. First, install TypeRocket. 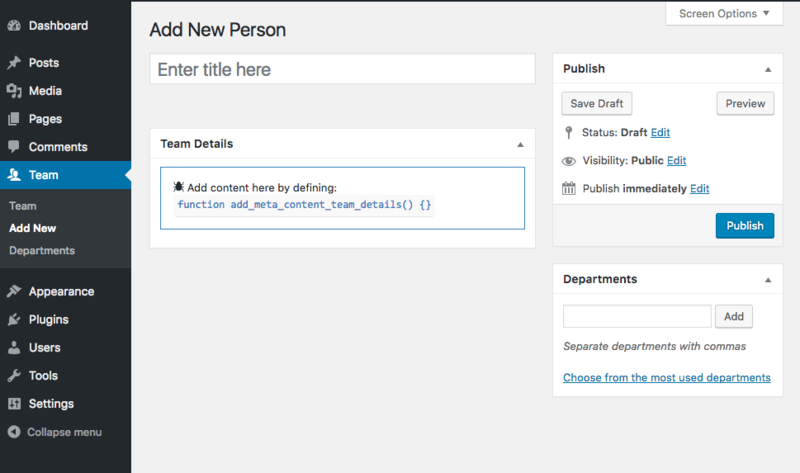 Then you can get started building out an advanced "team" post type right in the functions.php of our theme. That is it! The tr_post_type() function adds the post type. No hooks needed. The first parameter of tr_post_type() is the singular name of our post type. It will be the post types name/id and labeling. The second is the plural name and is mainly for labeling. In some cases, you do not want the name WordPress registers the post type as to be the singular name. Change it by setting the object's id. Finally, be sure you flush the WordPress permalinks. You can override any of the TypeRocket defaults settings for post types. The settings/args are the same as you normally use with register_post_type() in the WordPress API. The settings you picked for the post type gives support for just the title field. This removes the default content editor. Add some custom fields to tr_team. You want them in a meta box. Add a meta box to the post type first. Do the same with a taxonomy. In the meta box, with dev mode on, TypeRocket gives supplies the callback you need to echo out form fields. Add a custom field for "Job Title". You want the title to be used for the person's name but the placeholder text says "Enter title here". You need to change the placeholder text to "Enter full name here". You do not want the person's photo or about field in the meta box. Add them after the title in the content area. Next the editor field for the main content. Take the about field one step further. Using an editor field lets save the content to post_content in the wp_posts table. Note: When a field uses the name of a column in the WordPress database it will be saved to it instead of being saved as meta data. 20 lines of code. If you want to see this on the front-end you are ready to theme with custom fields. 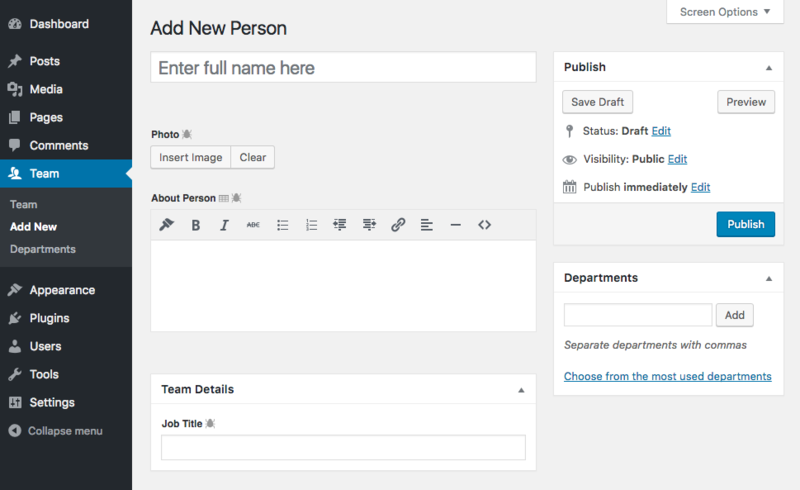 Now that you have a custom post type with some custom fields you are ready to start templating. Learn about templating with custom fields in the Post Types: Theming Custom Fields Tutorial.